In an attempt to clean out some of my magazine scraps, I came across a recipe I thought might be a success. Boy was it! 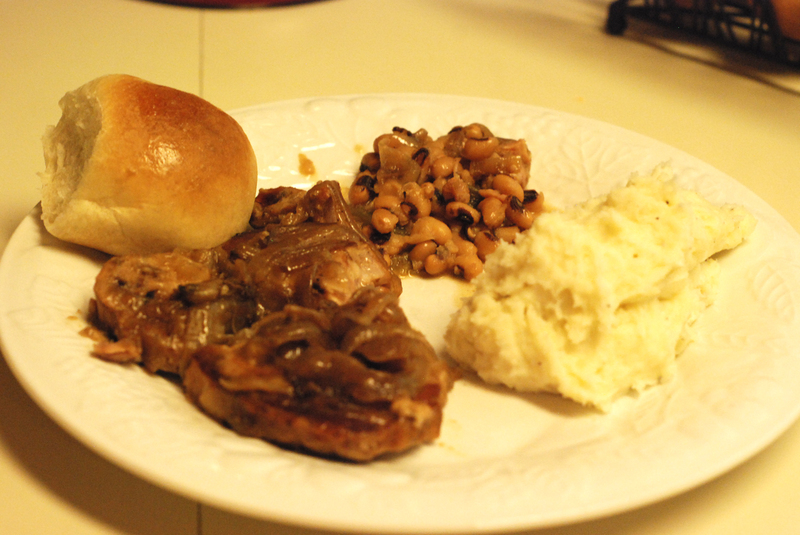 This is a great recipe for when you are “country hungry” as Mamaw says. 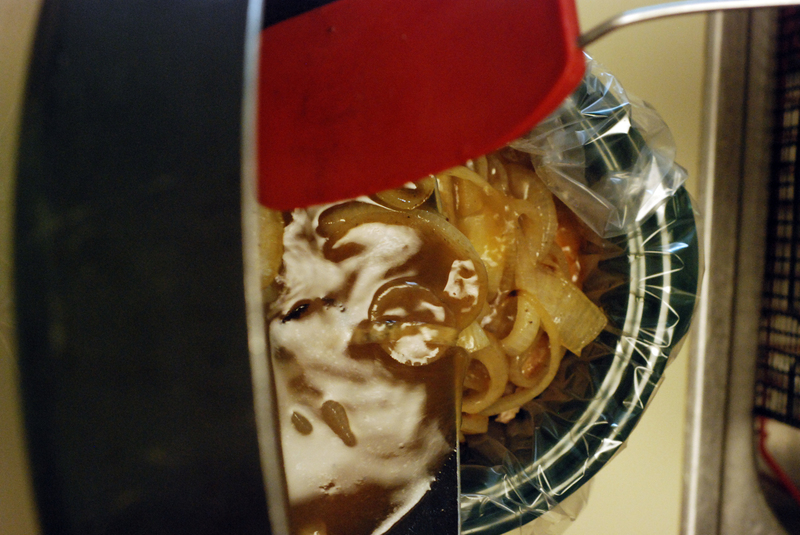 Like many slow-cooker recipes, you do have to do a little prep work before you turn on your pot. As you know, we like pork chops at our house. The name of the blog should let you know that! I usually buy the boneless chops. They are usually the ones that are on sale. The bone-in meats tend to have a bit more flavor to them though. This recipe calls for bone-in pork chops. I found some on sale, so ta da, I tried this recipe. 1. 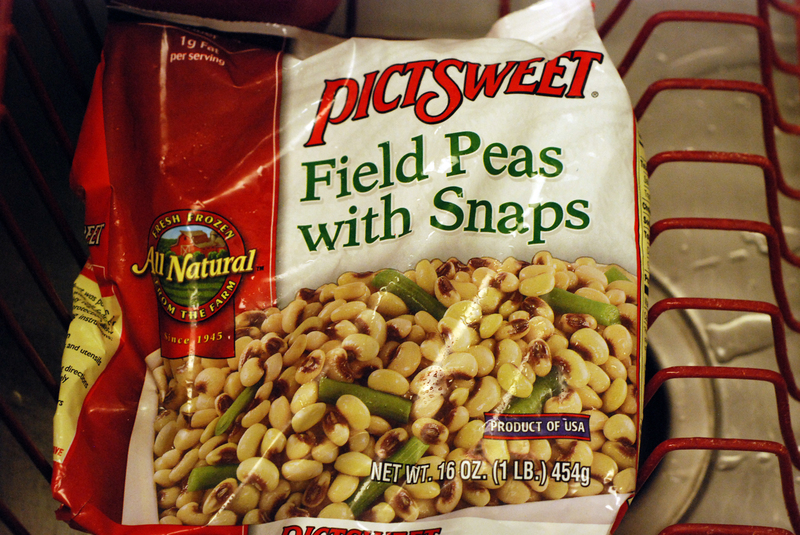 The first thing you need to do is take your peas out of the freezer. Mine weren’t completely thawed. They turned out just fine. 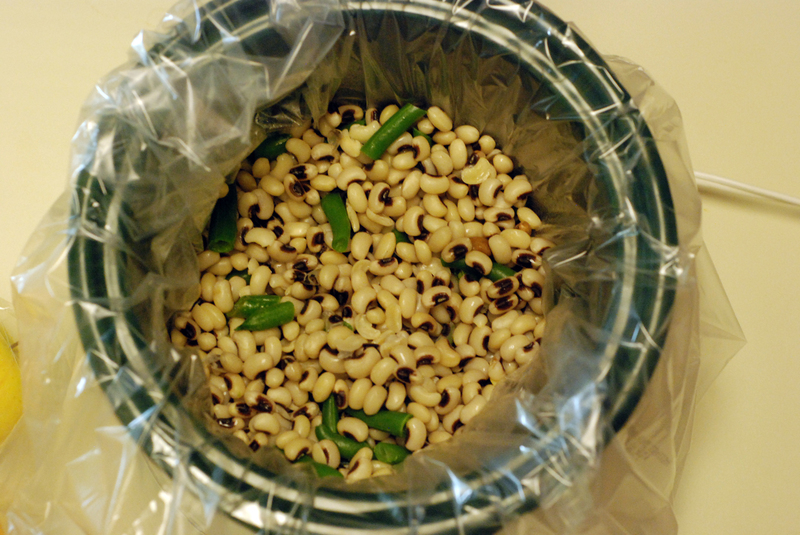 If you want, you can go ahead and dump them in your crock pot. 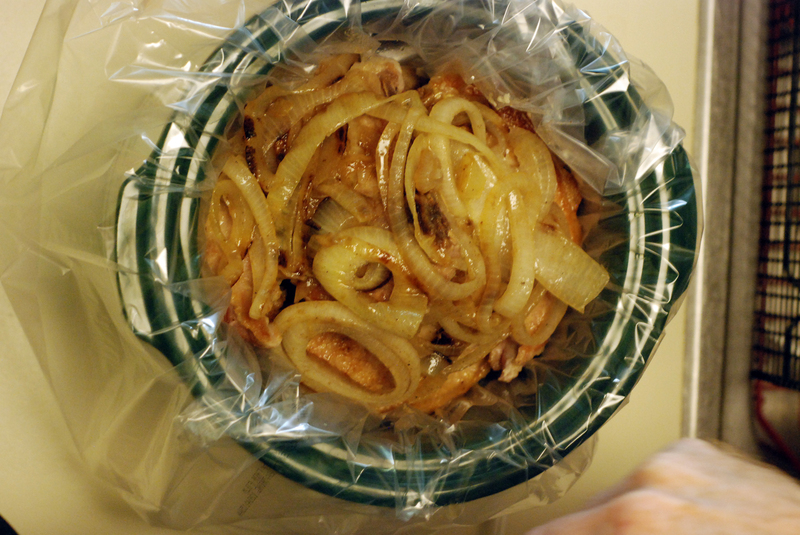 I used on of those handy-dandy crock pot liners. If you don’t use one, you will need to lightly grease your pot. 2. Mix the mustard, salt and garlic powder together. Rub the mixture all over your chops. 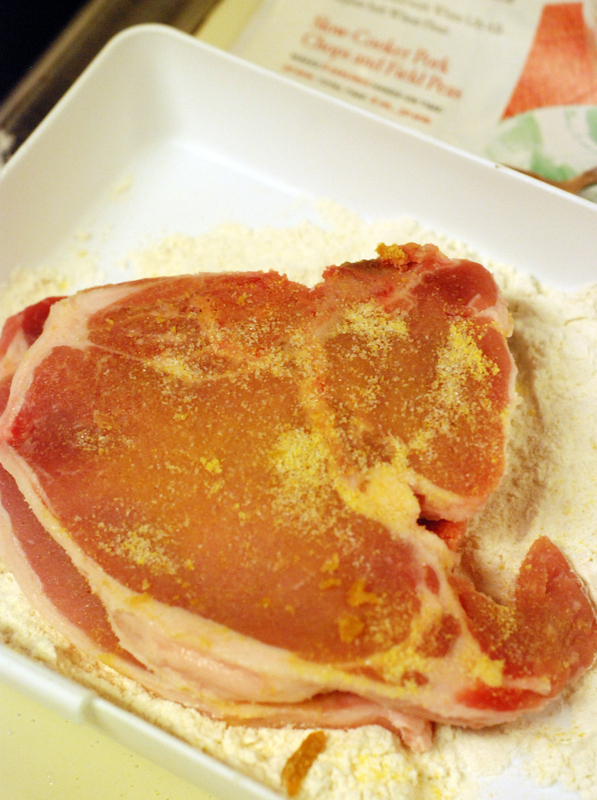 Then you dredge the chops in the flour. The recipe called for 6 pork chops. I only had 4. 3. 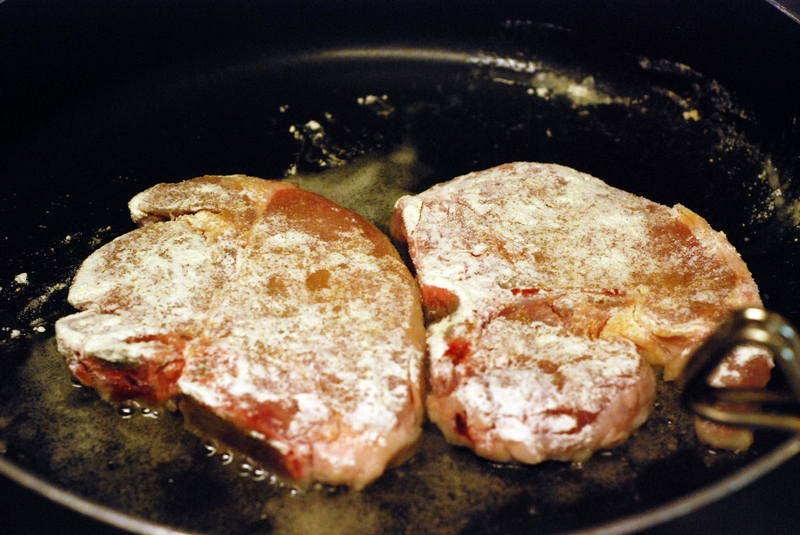 Cook the pork chops in hot oil over medium-high heat 3-4 minutes per side until browned. You just want to get some good crustiness on the outside. They will cook the rest of the way in the crock pot. Only cook a couple of pieces at a time. It is never good to crowd your meat. 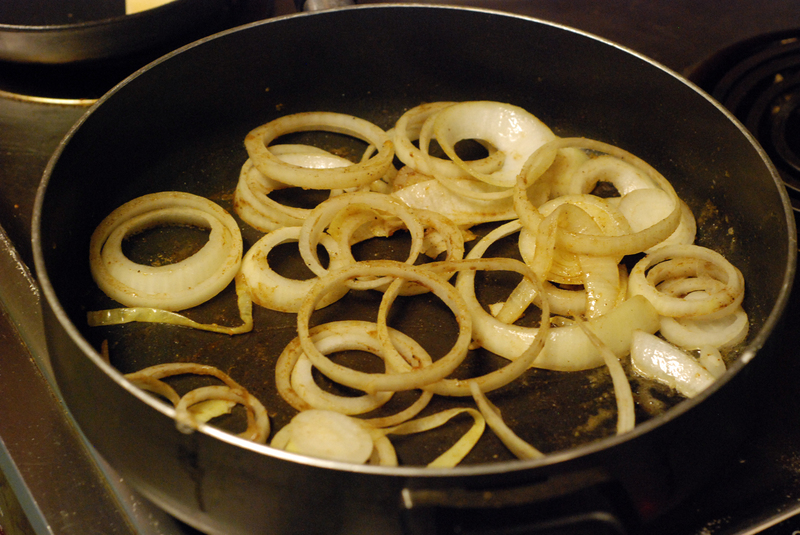 Save the drippings in the pan. 4. 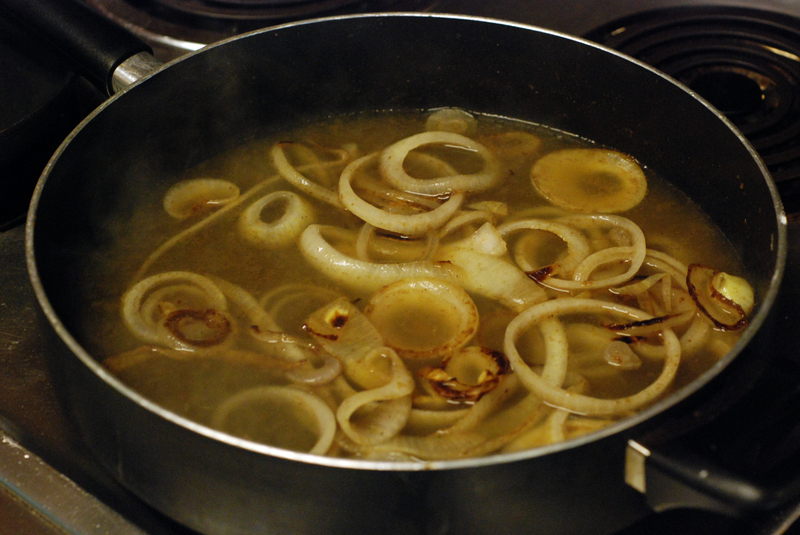 Saute´ the onion in the hot drippings over medium-high heat until tender. 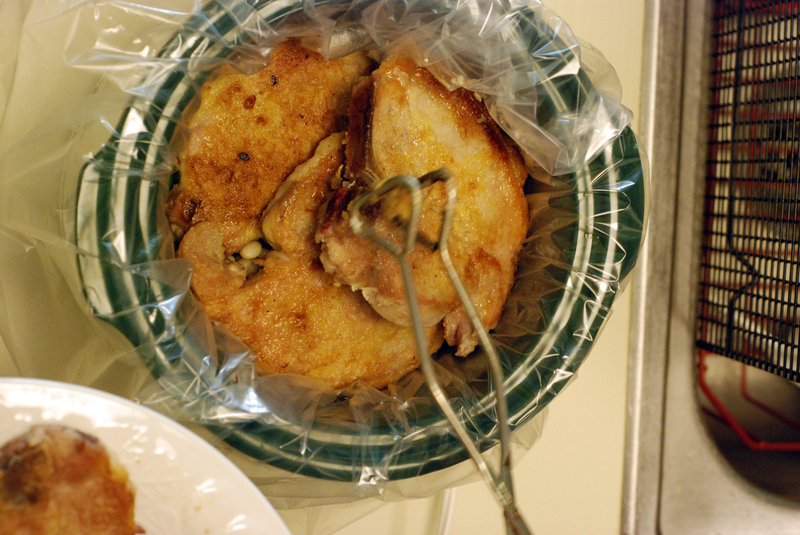 Add the chicken broth, and cook 2 minutes, stirring to loosen the goody from the bottom of the pan. 5. 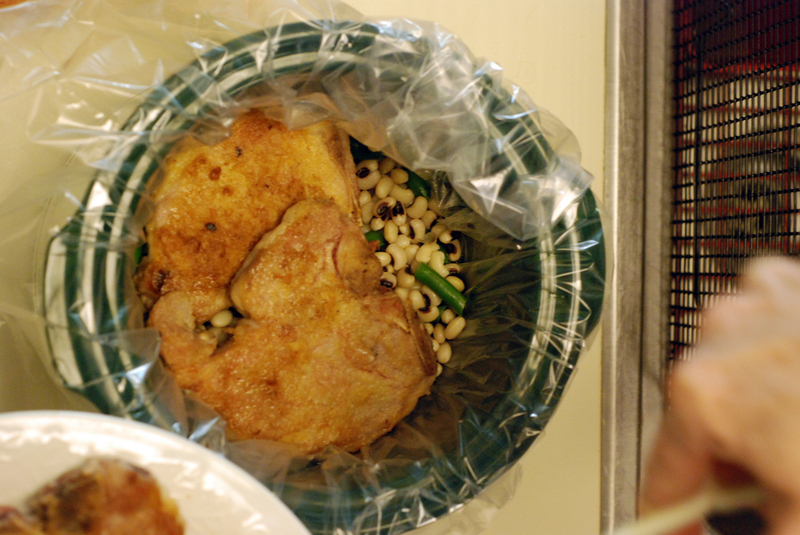 Put the browned pork chops in the crock pot on top of the peas. 6. Cover and cook on LOW 6 hours. 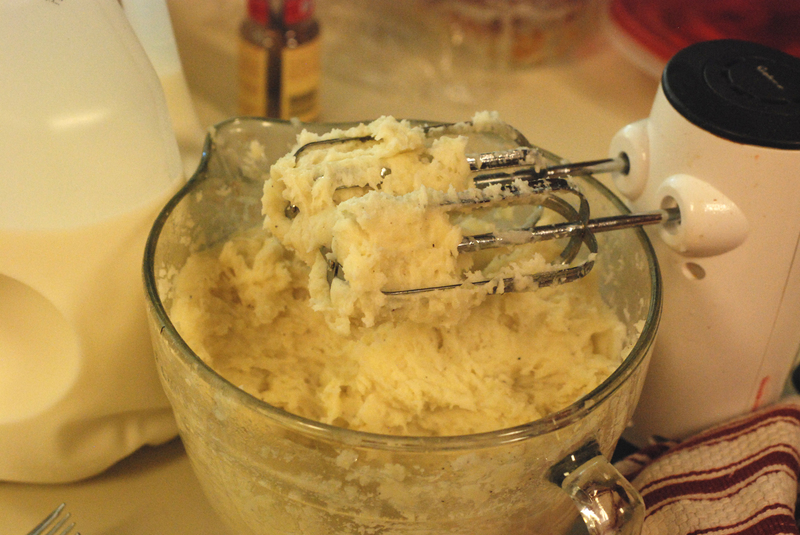 In the mean time, make your mashed potatoes–yum! The meat just fell off the bone. Consider that a warning! We had to pick some bones out of the peas, so BEWARE! The rolls were frozen Rhodes dinner rolls. All you have to do there is let them rise then pop ’em in the oven! This was an EXCELLENT dish! Katie thought it was funny that I was making dinner right after breakfast. Next time I may try this with the boneless chops just to see how it does. 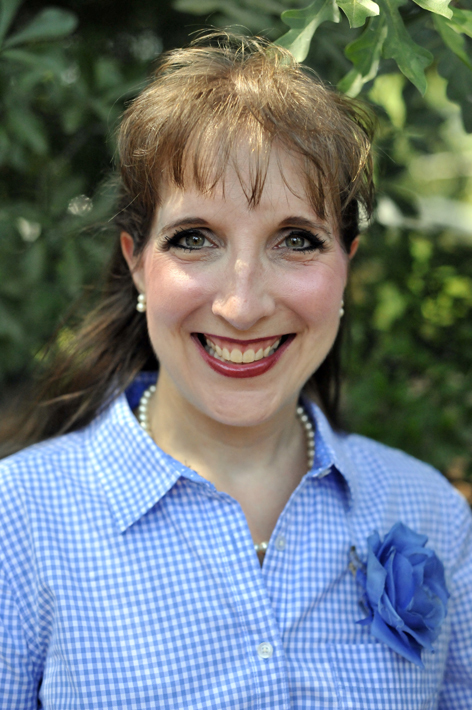 Chip: I come from a long line of pork chop aficionados. 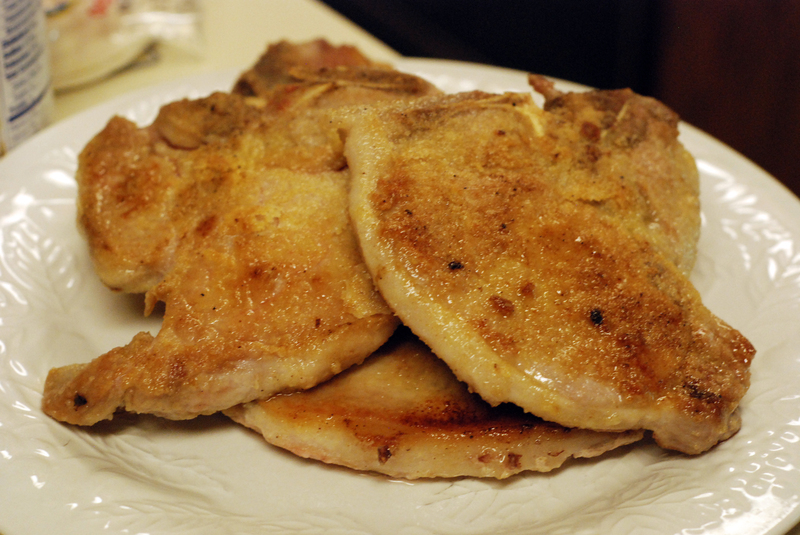 I grew up eating the finest pork chops in the western world. Now, I don’t want to overstate my view of this particular meal, but it may have been the finest pork chop dinner I’ve ever had. 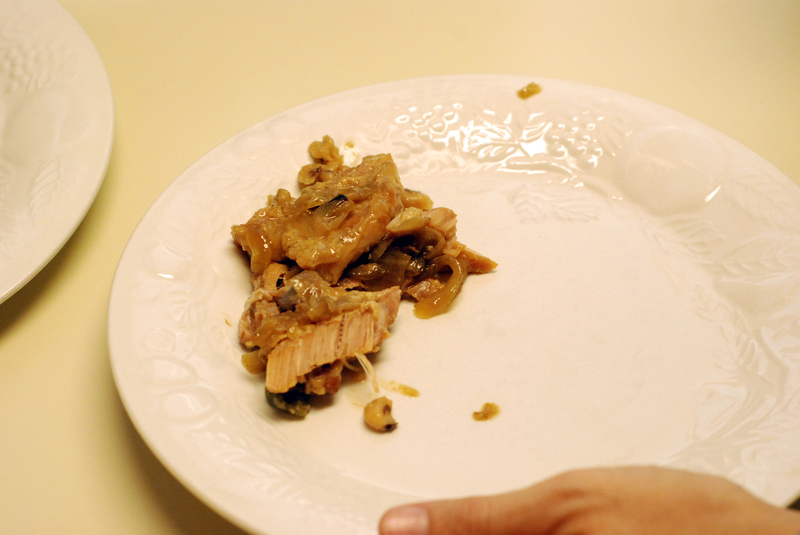 Megan: The word “meal” cannot describe this dish adequately. Rather, it is a superb work of artistry! Katie: That has been one of the best meals that I’ve had in a while! It was just sooo good!